I got lots of rest this weekend but I was also super busy. How does that work, you ask? Well, I spent most of the weekend sitting on the sofa watching DVDs... but with a pencil and pile of paper in my hands and boxes of felt at my feet as I had a whole bunch of design proposals to get sorted ready for a couple of looming deadlines. 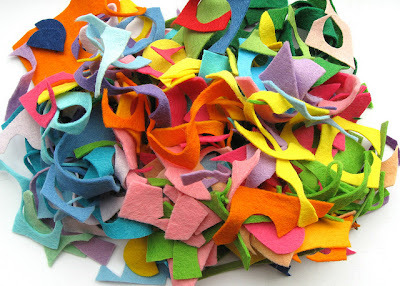 There was lots of sketching and scribbling and thinking and rummaging in my felt stash for the perfect shade of felt! Mmm... so much delicious colour. In other felt-y news, I've reduced the price of my remaining stock of felt squares. You can find them HERE.